The era of car computers is upon us, and it’s a little scary from a privacy perspective. Look no further than the recent controversy of how much data Google is collecting about drivers using Android Auto. We know this much: Google is probably collecting more data than you realize. Certain pieces of data must be collected and mailed back to Mountain View, California. Stuff like vehicle speed, throttle position, coolant and oil temperature, engine revs – basically Google wants a complete OBD2 [on-board diagnostics] dump whenever someone activates Android Auto. Apple, by way of stark contrast, only wants to know if the car is moving while Apple Play is in use. We take privacy very seriously and do not collect the data the Motor Trend article claims such as throttle position, oil temp, and coolant temp. 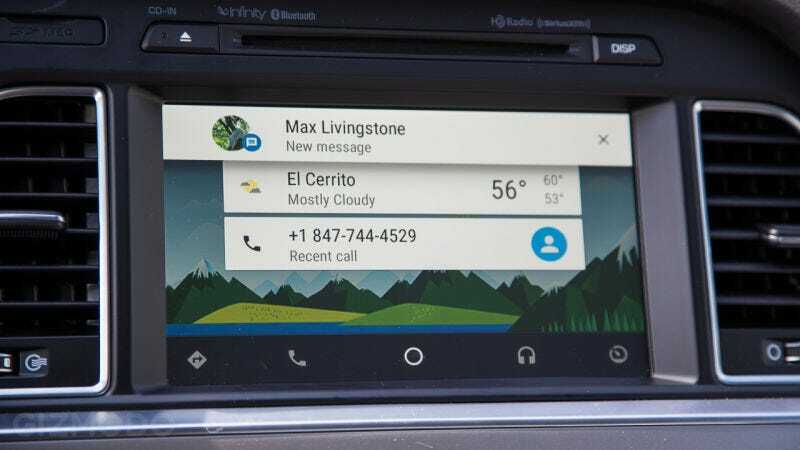 Users opt in to share information with Android Auto that improves their experience, so the system can be hands-free when in drive and provide more accurate navigation through the car’s GPS. So based on that statement, we can surmise that Google is indeed tracking vehicle speed and engine revs. While you could imagine how speed-tracking could be used for better navigation, you also have to wonder why Google doesn’t just rely on the GPS data like it does when the Android device isn’t plugged into a car. Nevertheless, the confusion highlights a growing concern with our computer-powered cars and the practice of data collection. The main concern, of course, is privacy. If even automotive journalists are confused about how much data Google’s collecting through Android Auto, you can bet the average driver doesn’t have a clue. Is Google collecting data about your driving habits to serve you better ads? It’s not a crazy question, especially since Google scans every Gmail message that passes through its servers for the purpose of ad targeting. You also have to wonder just how how Android Auto is interacting with the car’s central nervous system, also known as a CAN bus. The idea that Google is keeping an eye on your engine immediately raises some security concerns. By rewriting firmware in the car’s infotainment system, infamous car hackers Charlie Miller and Chris Valasek were able to remotely control a Jeep Cherokee. The vulnerability ultimately caused Chrysler to recall 1.4 million vehicles. Since Android security is historically problematic, does giving hackers yet another way to access the engine a good idea? These aren’t necessarily Google-centric questions. Connecting our cars to the internet is generally problematic. However, it’s apparent that something is up with Android Auto. The software is talking to cars more than Apple CarPlay, and it’s creating some welcome controversy. Let’s just hope Google responds not just with a statement, but with a change in its data collection policies.